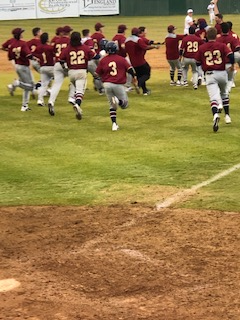 Texas A&M University-Texarkana players swarm Marquise Glenn at first base after he walked to force home the winning run in the eighth inning Friday. The Eagles won three of four games against Lindenwood University (Ill.). 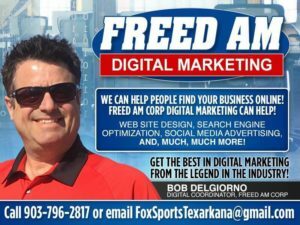 Texas A&M University-Texarkana pitchers hurled 22 consecutive scoreless innings after Thursday’s season opening loss to Lindenwood University (Ill.) at George Dobson Field. After splitting Thursday’s twinbill, the Eagles swept the Lynx in Friday’s doubleheader, 5-0 and 2-1 in eight innings. California native Sam Wells went the distance on the mound Friday as the Eagles blanked Lindenwood University, 5-0. 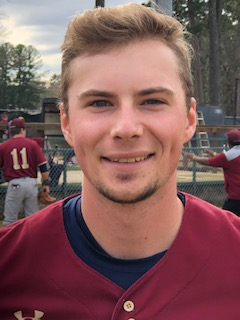 Junior Sam Wells of Sebastopol, Calif., went the distance, scattering five hits, while walking two and striking out two in the opener. Six-foot-7 Noah Vaughn of Aubrey, Texas, won the nightcap in relief. “Sam pitched a lot like their first guy did Thursday,” Eagles mentor Steve Jones said. “We played good defense behind him, and that was the key to winning the opener. Scoring two runs in the first inning opened up our offense a bit. We didn’t have to play from behind, and therefore we were able to do some things we like to do. 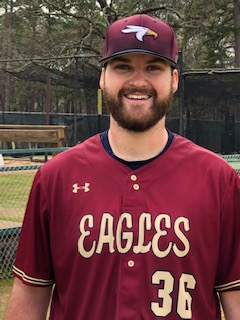 The Eagles had a season-high seven hits in the first game Thursday, with McDonald, a native of Vancouver, British Columbia, driving home three runs with two doubles. Canadian native Jake McDonald helped Texas A&M University-Texarkana sweep a doubleheader from Lindenwood University Friday at George Dobson Field. McDonald doubled home another run in the second game, which gave Texarkana a 1-0 lead going to the seventh inning. Jones went to his bullpen in the seventh, but four walks later the score was deadlocked, 1-1. Fortunately for the Eagles, Lindenwood returned the favor in the bottom of the eighth with four free passes. Marquise Glenn got the fourth free pass on a 3-2 offering that scored pinch-runner Brayden Cook. The Eagles will be back in action at home next Friday and Saturday with doubleheaders against Friends University.